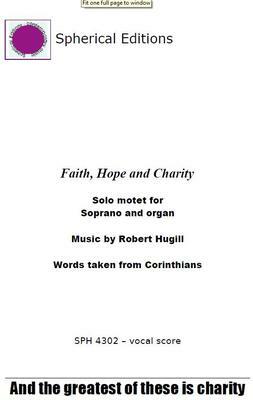 Robert Hugill's inspiring solo motet Faith, Hope and Charity setting text from 1 Corinthians for solo soprano and organ. The soprano sings the high solo line with its long cantilena whilst the organ provides a lyrical accompaniment. but then I shall know, even also as I am known. What do you want to know about Faith Hope and Charity?